On most of my trips, my go-to adviser for new eating experiences is Greedy Girl. Always on hand with a suggestion or two, she has never been known to disappoint. 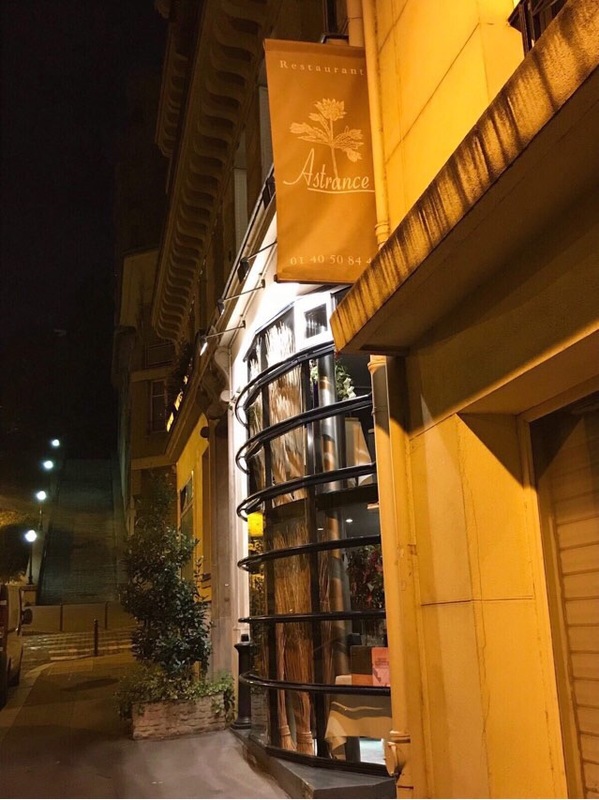 So, on a warm summer evening in Paris, FullAsAGoog and I took a quick cab ride from the 3rd arrondissement to the 16th to dine at L’Astrance. 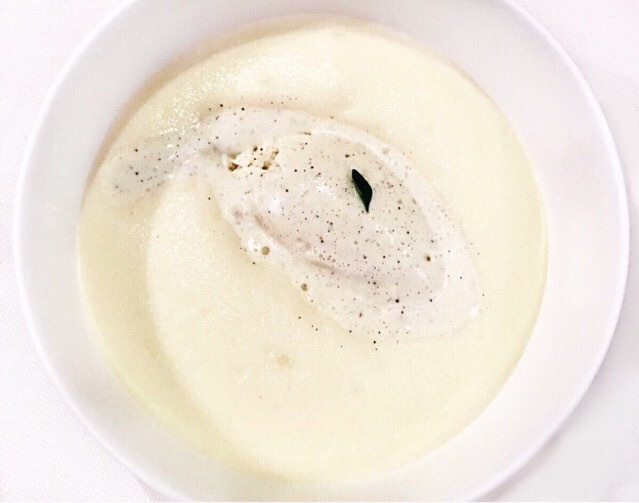 In 2018, it was in its 11th year as a 3-Michelin star restaurant (although in the latest edition is two stars). 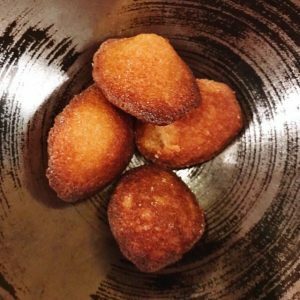 The restaurant, which only seats around 25 guests, is in an unassuming street off the busy Avenue de New York, just a stone’s throw across the Seine from the Tour Eiffel. The staff were warm and welcoming, the décor a lovely shade of mustard which brings a warmth to the room and while the few tables are far enough apart to enjoy some privacy it was also fun to engage with others around, some of whom were obvious regulars. 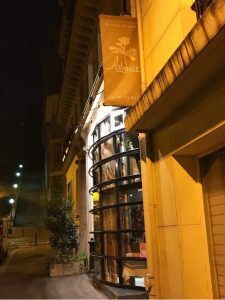 Dinner at L’Astrance is a surprise. There is no menu. You provide dietary requirements in advance (in my case, a nut allergy) but once seated, plates of food just begin to arrive. 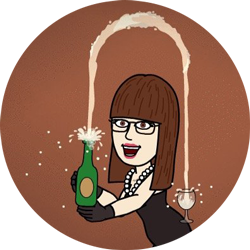 We chose not to have the matching wine, but instead began with a glass of champagne (when in Rome). 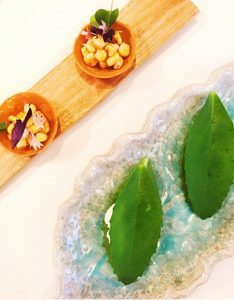 Our meal started out with tiny corn tartlets and the most perfect basil leaves you have ever seen, filled with goat’s cheese and lemon – both tasty morsels and we were off to a lovely start. The second course was layers of mille feuille pastry with a filling of mushroom and foie gras with a lemon sauce. This course had me at the foie gras; It was divine. Foie gras and mushrooms, for some, can be quite strong and heavy but this was deliciously light. 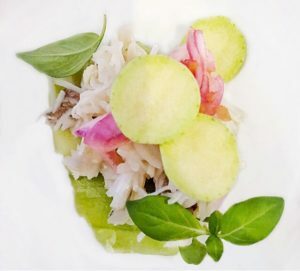 Next came a lighter course of crab with basil, cucumber and ginger. It was both refreshing and tangy. 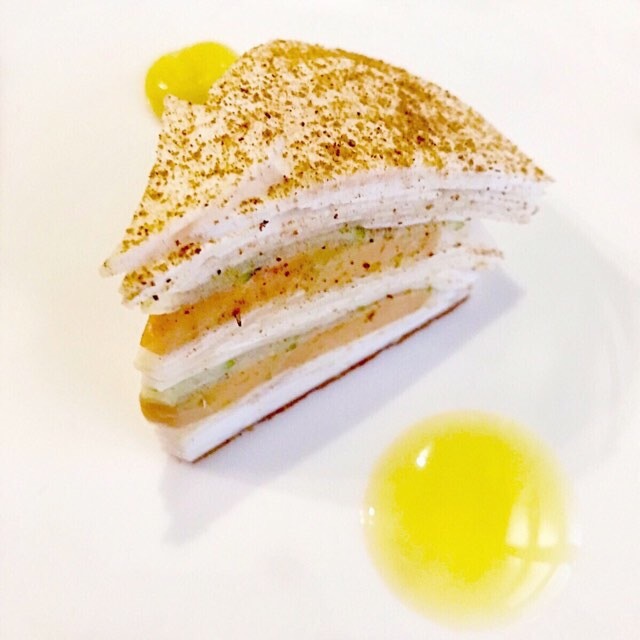 The perfect way to follow the mille feuille. 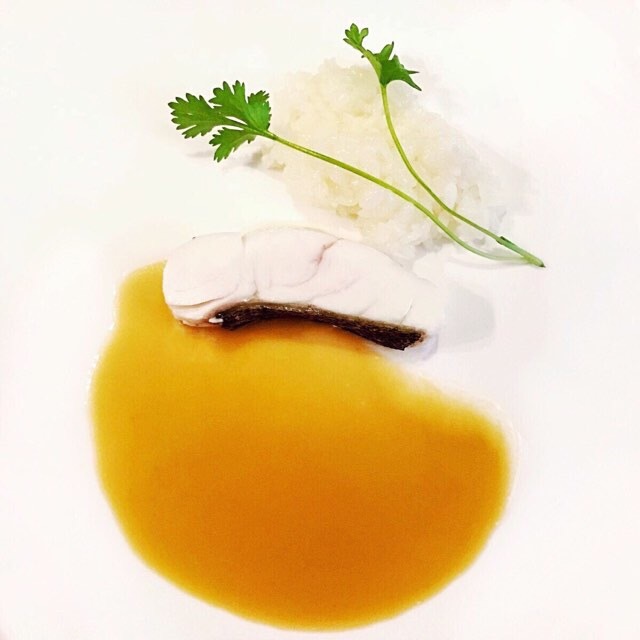 A fish course followed of turbot with Japanese rice and soy sauce with butter. Given the number of courses still to come, the fish was a generous portion and light. The lemony rice was creamy and, in all good ways, reminded me of lemon chicken so much so that I recalled my earliest dining out experiences at Chinese restaurants. It was nostalgic and comforting. 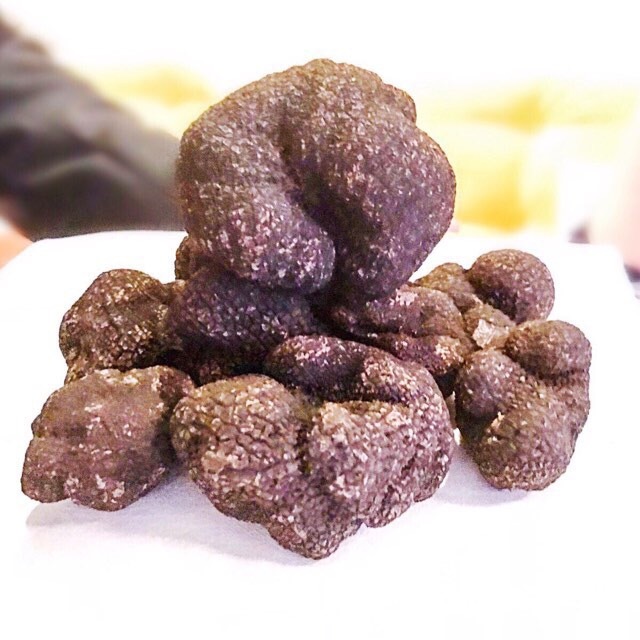 As an additional extra special offering, preserved on the bar, under a protective glass cloche housed L’Astrance’s “piece de resistance”, a rather large display of Australian black truffle (from Western Australia to be precise). I honestly didn’t expect to come to France to eat Australian truffle. In fact, I didn’t know it was a thing back home. On further reading, it seems the climate is well suited to truffle. 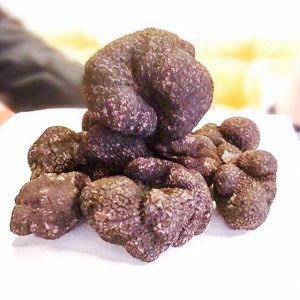 WA’s Perigord truffle production has recently overtaken France, and we are the second largest black truffle producer outside of Europe. 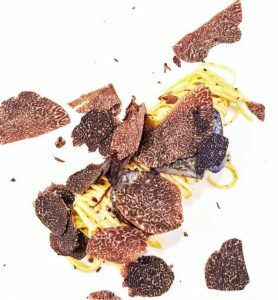 The plate of truffle, which looked less appealing than it tasted, was delivered to the table and shaved over tagliatelle. The truffle serving was generous and the flavour subtle. Next came chicken from central France with salad and green beans (pictured at the top of this post). The chicken was juicy and complemented by the Asian spices of the salad. 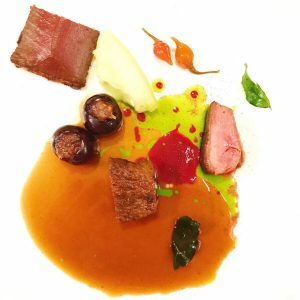 Duck followed, served with cooking jus, cucumber and salad, and tiny, sweet chilies from Brazil, along with duck liver pate and toast (and cherries stuffed with almond – which were excluded from my dish). As you can imagine, we were getting full, but the lightness of the salad cut through the rich duck meat. And then we were on to dessert. Or kind of. A white bowl with white filling arrived which we were told was mashed potato mixed with cream and vanilla ice cream with a thyme leaf. As a dessert lover, I found it an odd combination, yet still somehow managed to polish it off. How we were still going by this point, I have no idea. 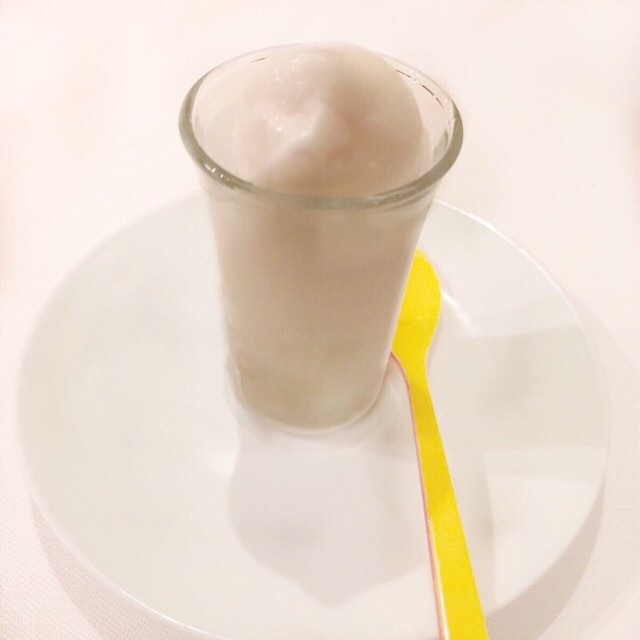 Thankfully for our palates, a shot of sweet chilli pepper, lemongrass and ginger sorbet arrived. It was perfect timing. Refreshing and just enough to make way for the finale. 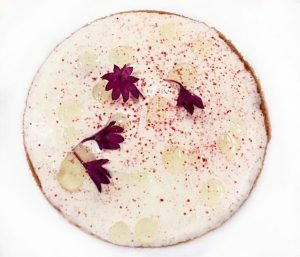 Our final dessert course was a rhubarb and raspberry tartlet with a jasmine foam. The flavours weren’t very strong but I don’t think I could have gone anything heavier by this point. Petit fours were still to come. An egg shell filled with a milk foam and jasmine tea arrived; An unusual choice of serving vessel with very subtle flavours. We felt it was more designed as a memorable, little gimmick as our night drew to a close. All this was topped off by some of the sweetest seasonal red fruits I have ever enjoyed. I am not sure what it is about France, but the berries seem to have a stronger, purer taste than anything I have had at home. And even though I was full I loved the juicy little pops of flavour. The final dish to arrive were madeleines with chestnut. Fortunately for me I couldn’t eat them, so FullAsAGoog had them to herself. She didn’t make it through the serving but did enjoy each bite. There were adequate rests between courses and, by the end of the meal, we were sharing stories of our favourite dishes with our neighbours. If you can get a reservation, L’Astrance also offers a smaller lunch menu to give you a literal taste of what they can do. With so many options in Paris, it is hard to know where to start, but without a doubt, at L’Astrance, you won’t go home hungry or disappointed. 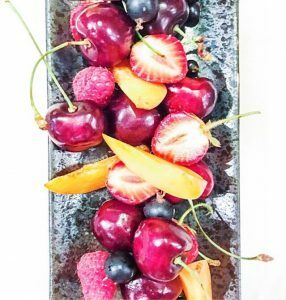 Emma Longmore, AKA NutsAboutTown, is a founding member of the Clean Plate Club.